Last summer, Denver Broncos quarterback Peyton Manning teamed up with Buick in a memorable commercial for the 2013 Buick Verano. 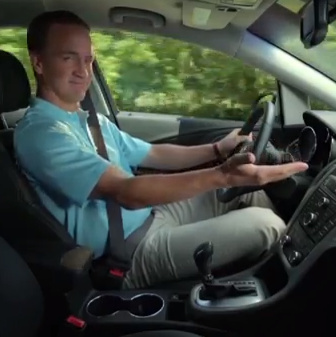 In the TV ad, Manning notes the car's ability to adjust to his audibles — "Orange barrel, re-route!" was his signature line. His teammates have obviously seen the ad, and they can quote the veteran QB his lines. "A lot of people enjoyed seeing the spot—my teammates come up to me and yell, 'XM 60 outlaw!'" Manning told Bader Media in an interview which included a sneak peek of Manning's latest Buick commercial. Manning's new Buick ad shows the QB talking about being blindsided on the football field—something he says won't happen on the road thanks to Verano's safety features. The commercial will air tonight during the 2013 NCCA Final Four contests between Louisville and Wichita State (6:09 ET, CBS) and Michigan and Syracuse (8:49 ET, CBS).